Hydrogen sulfide is a chemical compound known as H2S. It is extremely flammable, toxic, and dangerous to both living organisms and nature. It is a colorless gas that carries the unpleasant odor of rotten eggs. Hydrogen sulfide can occur both in nature and by human activities. The natural production of hydrogen sulfide occurs in volcanic gases by the bacterial action during the decay of plant and animal protein. It can be occur during extracting and drilling natural gas or crude oil. Hydrogen sulfide is used in industry, such as producing elemental sulfur, and sulfuric acid. It is also used for preparing inorganic sulfides like sodium sulfide and sodium hydrosulfide. Because of the high toxicity of hydrogen sulfide, there are some hazardous health effects on exposure. From the low concentration to high concentration, it can cause headaches, paralysis and even death. Hydrogen sulfide has the smell of rotten eggs. It is a colorless gas which is highly flammable. When it burns with air, a pale blue flame appears. When it is mixed with air, its limits of explosion are 4.3% to 46% by volume. Also the temperature of its autoignition is 260°C. The density ratio between hydrogen sulfide and air is 1.19:1, which means hydrogen sulfide is heavier than air. At water temperature 10°C, 20°C, 30°C and 40°C, one gram of hydrogen sulfide dissolves in 187ml, 242ml, 314ml and 405ml. Hydrogen sulfide can also be dissolved in alcohol, ether, glycerol, and in solutions of amines, alkali carbonates, bicarbonates and hydrosulfides. Hydrogen sulfide can go through oxidation reactions many times. Sulfur dioxide, sulfuric acid, or elemental sulfur are the product of the reactions. The reaction between hydrogen sulfide and aqueous solutions of chlorine, bromine, and iodine will form the elemental sulfur. The reaction between nitrogen with oxides and hydrogen sulfide will form sulfur dioxide or sulfuric acid in the gas phase, and form elemental sulfur in liquid phase. 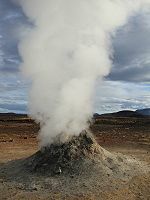 The production of hydrogen sulfide occurs in volcanic gases. The decay of plant and animal protein brings the bacterial action, which produces hydrogen sulfide. When compounds that contains sulfur-bearing amino acids decay, bacteria, fungi, and actinomycetes bring out hydrogen sulfide to the environment. Hydrogen sulfide exists around sulfur springs and lakes. It also exists as an air contaminant in areas that are geothermal active. Hydrogen sulfide can be released by human activity. During extracting and drilling natural gas or crude oil, hydrogen sulfide can be released. Crude oil contains up to 5% of sulfur. The estimated amount of hydrogen sulfide is 15%~ 25% of the natural gas in the U.S.  Another activity, the development and use of geothermal resources can release hydrogen sulfide. Industrial operations can form hydrogen sulfide whenever elemental sulfur or certain sulfur-containing compounds contact with organic materials at high temperatures. Hydrogen Sulfide is an extremely flammable and toxic to living organisms and nature. On one survey, there were 221 accidents on hydrogen sulfide poisoning. 6% of them died, and they mostly had neurological symptoms. 40% people of the overall accidents got helped with respiratory assistance. OSHA regulated the permissible exposure limit of hydrogen sulfide which is from 20 parts per million (ppm) ceiling concentration to 50 (ppm)for less than 10 minutes. Inhaling concentrations of 500-1000 (ppm) will cause respiratory paralysis and lead to death. Inhaling low concentration will cause headache, stomachaches, and dizziness. Concentrations of 20-30 (ppm) can paralyze the respiratory center of the brain and olfactory nerve. So smelling should not be used as a warning sign. Hydrogen sulfide can cause death easily. Knowing how to prevent and respond to the accident can save people. ↑ Hydrogen Sulfide "Wikipedia".Web. 14 Jan. 2016-accessed. Unknown Author. ↑ 2.0 2.1 2.2 2.3 2.4 Dr M. Argirova. Hydrogen Sulfide IPCS INTERNATIONAL PROGRAMME ON CHEMICAL SAFETY. Web. accessed - 18 Jan 2016. ↑ 3.0 3.1 Hydrogen Sulfide HYDROGEN SULFIDE AND CARBONYL SULFIDE. Web. accessed - 18 Jan 2016. Unknown Author. ↑ 4.0 4.1 Hilton E., Kalusche. Hydrogen Sulfide - Health Effects, Detection and Exposure Prevention "Engineer Research and Development Center". Web. accessed- 18 Jan 2016. ↑ Tim, Ruggiero.Hydrogen Sulfide Earthworks. Web. accessed - 18 Jan 2016. This page was last modified on 9 February 2016, at 14:18.